In this paper, I intend to outline the basic characteristics of both philosophical and Christian ethics and investigate the crucial problem of their interaction in the sense of the relation between philosophical logos, reasoning, and Christian faith with regards to the existence of “good” and “evil” of human behaviour within society. The traditional and usual meaning of ethics lies in the research and study of the concept of “good” for man, in the sense of individual conduct and communication. The traditional meaning of morality is the study of the use of a given theory of ethics by human communities. In the popular understanding ethics has managed to combine a lofty level of high and rather abstract consideration with a kind of a widely accepted free moralism, which only a little refers to the everyday actual lives and practices of individuals and societies. Morality itself has come to mean and indicate chiefly a reference to sexual ethics, and in some cases certain puritanical attitude toward indulgence. In professional circles, in our era, ethics refers mainly to the making of moral judgments on preferential grounds, emotive theories confined to the corrections of inevitable errors in the use of moral language. Despite of any value of the above-mentioned definitions, the question is: how can individual ethics preempt the topic when the moral life of the individual is contingent upon the moral structure and concerted actions of societies? It is certain in any case that ethics is everyone’s concern, because there is no human life which is completely independent of any morality. Indeed, before we make decisions about any ethical theory it might be better if we knew the truth about ourselves, i.e. self-knowledge. But what is that truth and how could we recognize its limitations? Certainly, reality is always wider than our narrow schemes because life is both more wonderful and more terrible than it is usually conceded to be. The philosopher moves in a field of assorted concepts and among the battered remains of traditional systems. He tries to arrange them in a suitable way. He is more an act of discovery than of invention, though it requires some imagination to see how things could be made to occur together. - Certainly the theory of ethics is a theory and not an ethics. There is a theory about ethics and a theory in ethics. While ethics must be pursued in independence of practice, as any theory must, at the same time it is equally true that no theory which lacks applications would be worthy of consideration. - In order to formulate a theory of ethics one should not begin by establishing axioms and then proceed to deduce theorems from them. Nothing that precise. Nor should one start as it were, from the order and the spectrum and begin as Aristotle suggested in the Eudemian Ethics by advancing from “true but obscure judgments’’ (Book 1, 6) to arrive at clear ones. It has been widely accepted that empiricism is the leading edge of discovery while reason pronounces the final judgments. Aristotle perhaps is responsible for the emphasis on practical application from which the study of ethics has subsequently suffered. Such an emphasis is premature. In this sense he held that ethics is practical while metaphysics is theoretical. This, of course, would be entirely true only if morals were the direct practical application of metaphysics. Indeed, metaphysics, in any case, has many applications - all theories of one sort or another, each of which has its practical applications. Metaphysics is high theory and frequently applies to lesser theories. Ethics is a lesser theory and applies to practice. Ethics is still a theory and as theory it is needed. In this sense, we must determine what the good is before taking thought of one of its main subdivisions, which is human good. And then we must put the actual study of human good before the detailed study of moral codes. In fact it is true that ethics has a practical branch called morals, but ethics is no more intimately allied with practice than any other theory. - Moral practice cannot proceed on any sustained basis without norms. The exigencies of experience compel the working formulation and immediate adoption of interim concrete ideals. Thus norms are mainly matters of practical procedure even though how they are discovered may be theoretical and how they are introduced strategic. But ethics is both empirical as well as normative. It deals with actual situations as much as with the ideals suggested by them just as physics does with its physical world and mathematical formulations. It is very important to stress that an individual’ s reasons for his actions and a society’s rules for what is permitted to the individual are after all empirical elements; in fact they exist and have an affect in the world of matter and energy in space and time. But the values lying behind them are values in the same way that other values lie behind the physical elements. Whatever humans do it is human to do. No particular kind of behavior can be said to be more human that any other. Now, the question is, what is it best for humans to do, best for them and also perhaps best for the world? It is widely accepted that moral values have been held to be normative and physical values, empirical chiefly because moral values differ from society to society whereas physical values do not. But human communities and everything they contain in themselves, including the moral values built into their peculiar constructions, are empirical also. The normative is the locally empirical. It should be stressed that morality is substantive, it is constitutive first and regulative only afterwards. Instead, the customs, traditions, cultures and laws of a society are intended to integrate that particular society with its immediate environment. We should be reminded that the normative ‘’ought’’, given the confines of a particular society, is entirely determined from that ‘’is’’. Certainly it is conventional within a certain setup to assume a definite conception of what ought to be. In fact, the test of empirical values is not whether they are without exception and globally prevail, but whether they enter into material things in space and time and subsequently influence them. To a certain extent measurements cannot be allowed to make the difference between the normative and the empirical. We call what we can measure empirical and what we have not succeeded in measuring normative, mainly because we erect our success and our failure into world conditions, which they are not. For, as Plato said long ago, what exists can be measured even though, he might have added, in some cases we may not yet have succeed in working out the measuring techniques. To sum up all the above – mentioned efforts of interpreting the theory of ethics, we are accepting that morality has to do primarily with the rules of conduct in a given society, where the emphasis should be led upon the conscience of individual members. Ethics has to do with the comparative study of actual moralities, and from this study with what the ideal morality eventually should be: with what moralities have in common and with the means to establish by their aid the conception of the perfect morality for an ideal society, which is the hope and expectation of all peoples. It should be noticed that if ethics is the practice of the good, then the good is empirical; Further, if it is empirical then it should prove to be not exclusively human. Indeed, human good is a definite part of the good but not the whole of it, for surely other things can be good in themselves. Morality at the human level may be an emergent quality and peculiarly human; But something analogous to it must exist at other empirical levels. Instead, the effect of an official philosophy is to suppose that all philosophical questions have been settled. In fact, if an ethics has been chosen and is operating, why speculate any further about ethics? It was an advantage of the Greek Philosophy of the fifth and fourth centuries B.C. that the established philosophy did not preclude the exploration of philosophies; philosophy was absolutely free. In the Middle Ages, philosophy became the handmaiden of theology and St. Thomas Aquinas used philosophy for the rational defense of theology. In our days it is rather the voluntary slave of science. In other words it works the attempt to construct a science of ethics on the one hand and to escape from science on the other. Philosophy always asks the important questions, those for which no final answers have been found. But merely asking philosophical questions and finding supposed final answers can have the most important of practical effects. Ethics as a branch of philosophy has a crucial part to play in the foundation of human life. Indeed, ethical thought, in the sense of the attempt to formulate codes and principles of moral behavior, has always been a necessary feature of human cultures, but moral philosophy in the more precise sense can be said to begin with the Sophists of the Greek world in the fifth century B.C. The Sophists defended the idea of moral codes and the more radical of the their followers, as portrayed in Plato’s dialogues, concluded that, traditional moral standards are mere conventions. The challengers of traditional moral codes thus raised the fundamental question ‘’why be moral?’’ The moral philosophy of Plato and Aristotle can be seen as systematic attempts to answer that question. Plato deals with questions about the traditional virtues – temperance, courage, justice and piety. The goodness of these virtues depends on how they are helping men to achieve a good life. In his work The Republic Plato argues that the good life consists in the harmony of the soul - reason, spirit, and appetite – performing its proper function. The traditional virtues can then all be defined as aspects of this underlying condition of psychic harmony. Since such a condition is one in which the person is happy and flourishing, the morally good life, lived in accordance with the virtues, is thereby shown to be the best life for human beings. This is the answer of Plato to the question: why should I be moral? Plato’s theory of ethics is closely connected with his belief in the immortality of the soul, as it appears in his dialogues Republic, Phaedrus, Phaedo, and Symposium. He does retain the early view that virtue is a condition of the soul, but wisdom is now viewed as a virtue of the reasoning part, whereas courage is a virtue of the spirited part, and justice is explained as a suitable ‘’harmony’’ between the three parts. Although there are important differences between the moral philosophies of Plato and Aristotle, the latter employs the same broad framework. In his work Nicomachean Ethics, Aristotle asserts that the ultimate end of all human action is happiness (eudaimonia). Aristotle’s explains that happiness is the distinctive function of human beings as an activity in accordance with reason. This then provides the hypothesis for a general account of the moral virtues; They are dispositions in which our feelings and emotions are guided by reason so that our behavior is appropriate to the situation. In fact, the continuous guidance of reason requires the avoidance of excess or deficiency, and therefore each virtue is, in Aristotle’s famous phrase, a ‘’mean’’ between these extremes (τό μέσον ὡς χρυσοῦς κανών). Epicurus held that ethics is based upon hedonism, the identification of good with pleasure (ἡδονή). But the true hedonism for the Epicureans was principally that of mental tranquility, to be achieved by banishing superstitions, fears of the gods and the after life. The Stoics suggested that ethics is based on the achievement of good life, which derives from the living in accordance with nature or the natural law. This stoic version of ethics echoes Plato’s and Aristotle’s teaching ‘’acting in accordance with reason’’. Since for the Stoics this meant especially rendering oneself immune to the disturbances of the emotions, their actual ideal was in practice akin to the mental tranquility of the Epicureans. Ethical requirements can readily be thought of as commands – with authority behind them. The question is: whose authority? Could it be that the sole ground for moral judgments is their being willed or forbidden by God? Could His will, alone, constitute moral rightness? That would certainly imply that we can accept the existence of moral requirements only in the case that we definitely believe in God and then can know his commands. In this sense, to speak of morality is no more than to say that, as a matter of fact, God wills or commands. Obviously a religious person will say that what God commands is right and good. But if all we mean by ‘’ morally right and good’’ is ‘’what God commands….is what God commands. No longer news, but only a trivially true statement. In fact, the divine command is: the command of a being with total power over his universe. In this case how can we speak of appraising the command of such a being? Natural though this response is, it would definitely reduce morality to mere passivity under divine power. Hence the worship of God (in the Judaeo–Christian tradition) has been very different indeed from the worship of sheer power. In the supposition that there is no God, no life after the death of the body, and no final vindication of good and defeat of evil, can the moral life be lived seriously, and to a certain extent altruistic concern sustained? Indeed, a secular moralist will argue that morality does not lose its viability and seriousness in the absence of a God and a future life; in fact, the opposite is at least as reasonable: individual moral agents are more thoroughly responsible for one other. It must be acknowledged that religions have played an important role in moral learning and, certainly, in moral acting. It is widely accepted that the popular conception of morality is closely connected with religion. Sometimes, the belief referring to the equation of moral concepts with divine commands is very strong. Although both Plato and Aristotle were theists and to a certain extent they believed in one God, the Supreme Good and the First Unmoved Mover, respectively, their ethics is not a religion ethics and their one God is not a divine lawgiver; At most he is an exemplar of the Ideal life. The moral philosophy of Medieval Christendom, however, involved an attempt to marry Christian morality to Greek philosophy, and the most influential version of this effort was that of St. Thomas Aquinas, whose philosophical speculation reflected the Aristotelian philosophy, which he had received through the Arabian translations of Aristotle’s works. In particular, Aristotle had talked of a human ‘’function’’, but had made no use of the idea that this function might be seen as a necessary purpose bestowed upon human beings by a divine creator. Indeed, from an understanding of human nature we can identify the natural purposes proper to human beings, and to fulfill these purposes is to follow exclusively: ‘’natural law’’. Obviously, this natural law reflects our immediate participation in the eternal law by which the whole universe is manifested, it is exhibited in the divine law laid down for us by the divine creator, and the moral rules of natural law will therefore coincide with the moral rules revealed by the Christian doctrine. No one can assure us that this synthesis can, in any case, be a stable one. It should be stressed once more that any attempt to identify moral principles with divine commands must run up against a dilemma first formulated in Plato’s dialogue Euthyphro: Is the good, good because God commands it, or does God command it because it is good? If the former, then morality is the product of arbitrary will, and obedience to morality is mere obedience to divine authority. If the latter, then morality is independent of God’s will and command. Certainly knowledge of the divine will is at best redundant. In fact, the ethical question refers to the relation between morality and God’s will as well as omnipotence. Are the commands of God the source of ethical rule? Similar theories have been expressed by Thomas Hobbes and John Locke, which have been rejected by Professor Gudworth in his work “Eternal and immutable morality”. Indeed, the actions are good or bad by nature and not simply by will. Some scholars, such as E. Hutcheson, expressed the view that the moral principles are innate, but others believed that the creator could have given the opposite sense of ethical tendency. According to Plato, all the content of morality, as well as that of religion, consists the essence of human behaviour. We are reminded that for Socrates, the whole virtue is the knowledge of the good. In this sense, morality is both service to God and service to man. Nobody can service God and neglect man and vice versa. Indeed, Plato states that the morality in man’s life leads him to the imitation of God (ὁμοίωσις Θεῷ). In this sense, any behaviour against God is a moral violation and respectively any moral slip is a religious fault. It is evident that Thomas Aquina’s attempt to mixed up the God’s will with man’s expectations is therefore liable to collapse in one of the two directions. Obviously if we still insist on the fact that morality is to be found exclusively in the commands of God revealed in a particular organized religion, certainly these commands will have to be taken on trust and moral philosophy thus will have no role to play any more. On the other hand, if, in any case, philosophical understanding can lead to the formulation of moral theory, religious belief will play no distinctive part in this process. Indeed, the second alternative is the one adopted by moral philosophy in the modern times; the mainstream tradition has been essentially a secular one. - The dialectic between Philosophical Ethics and the Christian doctrine on Ethics and Morality is based mainly on the ground of the transition from ancient Greek philosophical ethics to Christian consideration of man and its position within Christian communities. Virtue is the basic element of ethics, as it was recognized by Socrates, Plato, Aristotle and other philosophers. Usually virtue was closely connected with knowledge, a subject much discussed among Greek philosophers. Aristotle was the first philosopher who organized a system of applied ethics, where all intellectual reasoning was widely accepted by men in their everyday life mainly as the foundation of rules by which the life of the citizens was formed. We have already stressed that the highest goal of Aristotelian ethics was the achievement of happiness (eudemonia). While Plato was searching for happiness in the world of Ideas, Aristotle recognized it within human societies, where all virtues consist the essence of happiness. Indeed, he stated that the perfect happiness overcomes the simple human nature and based on mind, soul’s highest and divine part, and leads man towards the deity. Hence Aristotle’s approach to theology. But it is clear that the Aristotelian theology is primarily intellectual and therefore is unable to approach the true happiness. Now the crucial question refers to the problem of immortality of the soul, for happiness exists only in close relationship with the doctrine of immortality. Aristotle taught the immortality of νοῡς (mind) and Plato’s teaching on immortality does not include the whole soul. In this sense man’s happiness remains uncertain. Despite the greatness of the Platonic and the Aristotelian philosophical speculation on ethics and happiness in particular, they did not offer any specific answer to crucial questions about immortality and death. The Christian answer to the inextricable Aristotelian doctrine is based on the search for human happiness within ethics. Here we have Christian love as the only answer to the perennial question of all humanity throughout the ages. Indeed, Christian love is the sole overcoming not only the law of corruption but even death itself. And man only as a participant of immortality is able to love even his enemy, something that is absolutely absent from philosophical ethics and morality. In this sense, Christian Ethics is based on a new ontology, which derives from the divine and human nature of Christ. Man, as a Christian believer, recognizes the already existing dichotomy in human nature. St Paul in his letter to the Romans (7, 15-24) explicitly described the contradiction between will and the law of sin, which can be solved only in Christ. It is certain that the Christian doctrine does not complete the theory of ethics and morality. The new element that is introduced by Christianity does not refer to the social or psychological level, but exclusively to anthropology and ontology. In other words, Christianity does not introduce a fresh mode of ethics and morality, but creates exclusively a new man, who is invited to live in a new life in Christ. This particular new man bases his new life on the new concept of truth, which liberates him from death. It should be reminded here that this truth is not identified with knowledge but incarnates the life itself, the life which opposes death for ever. The knowledge of that truth is not achieved by intellect, simply because human intellect, is necessarily subject to corruption and death, characteristic of all humans. Evidently this knowledge cannot provide happiness, because it is impossible to overcome the division of body and soul due to death. In this sense the knowledge which can be identified with happiness is that which liberates man from death. This knowledge exists potentially and it is up to man’s choice to accept it, since only through this knowledge comes the certainty of achieving the true happiness in Christ. 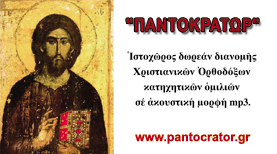 Christian ethics and morality is based upon the new ἦθος, the new person who lives in society according to the rules of Christian faith. This new person, who represents the true ethics is based upon the new Christian ontology and is understood only as the source of love for the enemy. This love for the enemy is the only way to overcome death. – Indeed, this Christian theory of Ethics, namely the love for the enemy is the completion of all virtues, which re-creates human beings throughout history. - ADLER, F. - McCAIN S., Ethics: The study of Moral Values, Chicago, 1962. - BERGSON, H., Οἱ δύο πηγές τῆς ἠθικῆς καὶ τῆς Θρησκείας, μετ. Β. Τατάκη, Ἀθῆναι. - DUPRÉAL, E., Traité de Morale Vol. I, II, Bruxelles, McMxxxii. Αυτή τη στιγμή διαβάζουν την ιστοσελίδα μας 54 επισκέπτες.